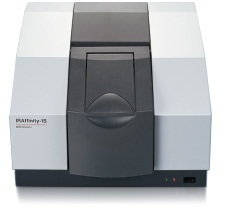 The IRAffinity-1S is a compact Fourier transform infrared spectrophotometer that is housed within an elegant form. The interferometer is continuously optimized by a dynamic alignment mechanism, and a built-in auto dryer helps ensure ease of maintenance. The IRAffinity-1S offers the high S/N ratio (30,000:1, 1-minute accumulation, neighborhood of 2,100 cm-1, peak-to-peak), a maximum resolution of 0.5 cm-1, and compact dimensions. Furthermore, the high-performance LabSolutions IR software, which emphasizes operability, and analysis support programs (Contaminant analysis program and Pharma Report program) make it easier to perform data processing and analysis. Through the incorporation of a high-energy ceramic light source, a temperature-controlled, high-sensitivity DLATGS detector, a high-throughput optical element, and the optimization of the electrical system and optical system, the IRAffinity-1S achieves the highest S/N ratio in its class. Beam splitters in the interferometers of FTIR instruments are susceptible to humidity. In order to maintain the long-term stability of the interferometer, the beam splitter must be protected. In the IRAffinity-1S, the interferometer is airtight and incorporates a unique internal auto dryer. By combining Shimadzu’s own algorithms (patent pending) with that of library spectra for common contaminants, this program identifies contaminants with a high degree of accuracy. Reports are automatically created after analysis, thereby reducing post-processing time to a few seconds. With automated reporting, this easy-to-use program allows operators with little FTIR knowledge to perform analysis easily. This program makes pass/fail judgments about samples in accordance with the tests specified in the Pharmacopoeia. In addition to identification tests for pharmaceutical products, this program can be used for incoming inspections and pre-shipment inspections. The IRAffinity-1S achieves a reduction of approximately 20% in installation area and width (compared with other Shimadzu products). Various accessories, to best meet your application requirements, are available.